Happy Easter everyone. HE HAS RISEN! Hope everyone has had a wonderful day with their families! It has been a great easter weeend here. 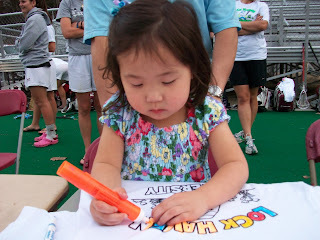 We have just hung around the house, and went to an easter event at the local college Thursday where A got to color a shirt, get her face painted, and participate in a great easter egg hunt! 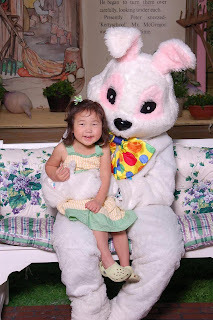 We also went to some friends to the nearest mall (a little over an hour away) to get pics made with the Easter bunny last week and had a great night out, enjoying dinner and music on a resturant patio. Absolutly perfect spring weather! It has just been a wonderful week! I hope everyone else has enjoyed to. Tomorrow we are off to the prk for a picnic lunch, library Tuesday, Storytime Wed.....and I have some new games that I am working on making this weekend, so pics of those and instructions will follow soon, so keep an eye out. 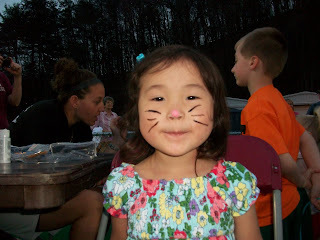 Some new reading and math games for A to explore :) Off to finish dinner, but I will leave yall with some Easter pics! "I want to be a whole Korean"